One Hour’s No Pressure Process ensures you get the perfect air conditioner, furnace, air handler, or heat pump installation at the best cost. Once your appointment is made, a comfort advisor will arrive on time and perform a total home energy analysis to determine the perfect size heating and cooling system for your home. If you choose One Hour, we will immediately schedule for an installation crew to install your new air conditioner, furnace, air handler or heat pump. Our team will arrive on the day we promise, or we pay you $500 guaranteed! Your installation is completed perfectly, with all wiring properly connected, all ductwork expertly sealed and every safety issue covered. They can answer any questions you have during the installation too! Our installation mechanics agree to regular drug and background checks for your peace of mind. We don’t curse, swear or use tobacco products while on your property. We always wear our yellow floor savers and lay down drop cloths so that your home is as clean when we leave as when we arrived. If we fail to respect your home in any of these areas, we’ll pay you five hundred bucks. If we break something we fix it. Your home comfort system works flawlessly for years, guaranteed. Every heating and air conditioning unit we install is covered by our “2 Year Trial Guarantee”. 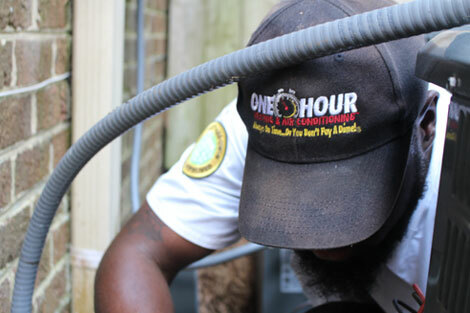 One Hour specializes in residential, non-commercial heating and air conditioning systems. We put our money where our guarantees are! In case you’re wondering, our team is not brand-specific. We service and install all major HVAC equipment, including the ones listed here.